It's Saturday and that means a new challenge at the Crazy4Challenges Blog. I am the hostess for January and our Guest Designer is my friend and Design Teammate Kelly Booth. This week my challenge is: Celebrate! January always feels so long, but it’s coming to a close. Make a card to Celebrate! 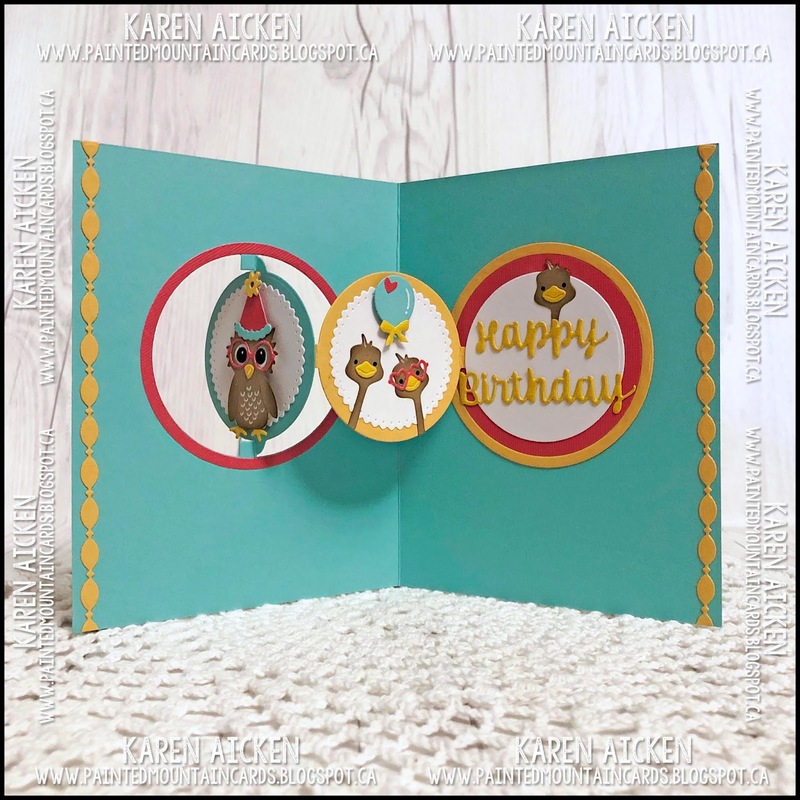 You can make a birthday card, a card to celebrate an upcoming holiday, a card for someone who has a new job, going on a vacation etc. Let’s Celebrate! I chose to make a fun Birthday Card using a bunch of dies by Karen Burniston. It turned out SO cute! 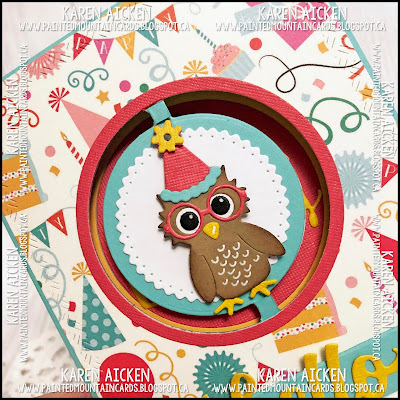 I started with the Circle Charm Pop-Up, and added an owl from the NEW Feathered Animals set. Of course he had to be wearing a party hat which is from the Birthday Charms. I also combined two different word set dies for the 'hello' and the fish tail banner. Karen Burniston's new release will be shipping at the end of the month, and is available for PRE-ORDER right now! I'll add a link at the bottom of my post. I snipped away the pom pom at the top and moved it down the hat slightly, to avoid it catching on the pivoting hinge. Alternatively, the hat could be moved down on the owl's head but I wanted him to wear his cheery red spectacles so I liked the hat where I placed it. 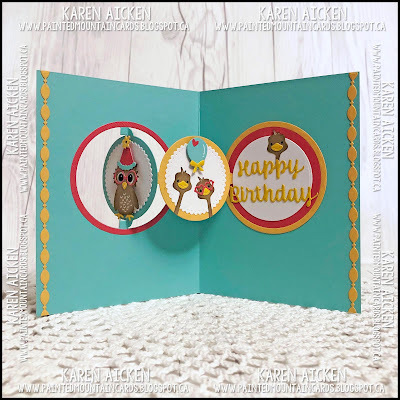 When you open the card, you see that the owl from the front pivots to the inside, and reveals three long necked birds and the Happy Birthday greeting. 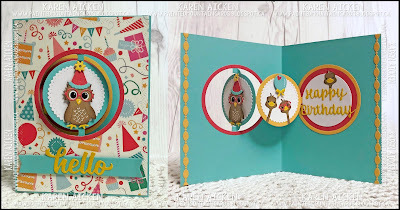 I also added two borders using the NEW Border Blends - Party. I kept the negative pieces to use on a different project as they are decorated with press dots. These Border Blends are going to be lots of fun - borders often add the perfect finishing touch, bringing colour and dimension with very little effort. I used the ostrich/turkey head from the die set, which I just adore. There is something about the shape of this head that appeals to me and makes me smile. I've made a Valentine Ostrich and a Peacock so far, and I'm looking forward to making 'proper' ostriches for some fun cards in the near future. There is also a new set of Tiny Accessories coming tomorrow which is going to be perfect for making all kinds of cards. I'm partial to the cape and mask, the layered hearts and these fun heart shaped spectacles which I used here. Finally, for those of you who like to pin 'fronts and insides' to your Pinterest boards - here you go! Check out the C4C blog to see how the Crazies have been inspired by the challenge. We'd love to see your take on it, so be sure to stop by the Crazy 4 Challenges blog and link up your creations. If you are uploading to an online gallery, please use the keyword C4C468. Check out the NEW RELEASE, which is available for pre-order right now on the WEBSITE! 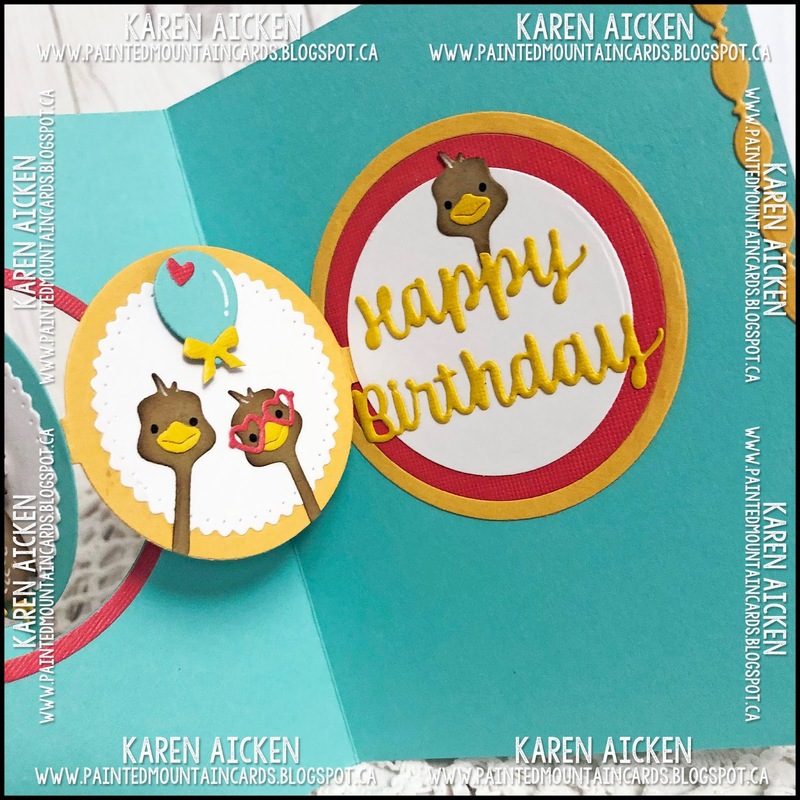 such a fun card to celebrate a birthday .... love that owl and those ostriches you have included on this.